Customer pull is an amazing feeling for a startup. Because the customer demand is visceral, everything seems to move quickly: sales is booking deals quicker than can be on-boarded; product and engineering are rushing to build the features customers request; marketing’s efforts to raise awareness of the business are magnified by word of mouth; and recruiting is doing all they can to fill the looming vacancies. 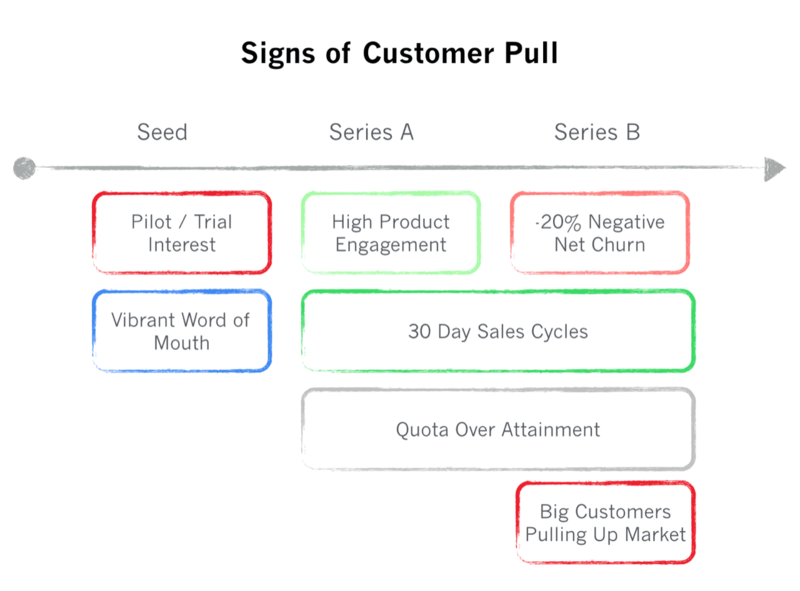 At seed, the first signs of strong customer pull are the quality of pilot and trial interest. While the volume varies by price point - freemium companies may have thousands of early customers, while $100k+ ACV companies may only have a handful - positive usage patterns indicate strong customer pull. So too does frequent product feedback. In addition, vibrant word of mouth proxied by social media mentions/follows, Github stars/forks for open source projects, and newsletter subscriber counts mark products with substantial latent demand. As a seed stage company grows, hires a sales team and deploys the product to more customers, the signs of customer pull evolve. Product engagement remains high. The company transitions from pilots with friendly customers to product sales. The sales cycles are fast, often less than 30 days: an email, one to three conversations, sometimes without a demo, and straight to a signed contract. As a result of these fast sales cycles, sales people exceed their quotas substantially. In some companies I’ve seen, sales reps a month in are booking more than $100k in new ARR per month. In a year or so, early customers will begin to renew their contracts, and these customers increase their spend rewarding the startup with negative net churn. Box, New Relic and others have achieved 30% negative net churn/account expansion annually. But in the early stages, companies with exceptional customer pull observe greater than 100% annual negative net churn. In addition to serving the core customer base well, startups with strong customer pull observe larger companies pulling them up market. Often these Fortune 2000 companies impose security, compliance and complex decision-making processes. But in these cases, these behemoths relax these constraints because they perceive the product as critical to their success. These signals of customer pull are strong validators for founders to understand when they have achieved a true product market fit and Templeton compression. Not surprisingly, these customer pull signals are the same investors use to understand the growth potential of a business.